Obviously, the plastic dining room furniture was optional, but most homes today do sport a microwave oven and a flat screen television. The Monsanto House of the Future was a result of four years of joint study and design by Monsanto and the Massa­chu­setts Institute of Tech­nology. Another earlier example of historic homes of the future were found at the “Homes of Tomorrow” at the Chicago World’s Fair in 1933 in keeping with the theme, “A Century of Progress.” These homes demonstrated modern residential conveniences and creative new building materials and techniques. Five of the original display homes were moved to Beverly Shores and are maintained by the Indiana Park Services at Indiana Dunes. The “House of Tomorrow,” the “Florida Tropical House,” and three other homes are all on the National Register of Historic Places. The homes are not open to the public but are part of a driving tour. A guide is available at the Dorothy Buell Memorial Visitor Center. 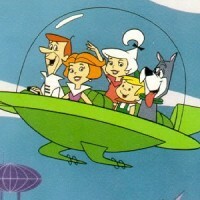 The popular television cartoon series, “The Jettsons,” was a whimsical look into the future. This prime time show ran from1962 to 1963 and featured such forward thinking inventions as a hovercraft and Rosie the Robot Maid. We do have Roomba’s and other robotic floor cleaners today, but the personal use hovercrafts are still in development. The Chicago Museum of Science and Industry recently featured an exhibit of one of Chicago’s greenest homes displaying the latest in technology, including solar film on the roof and many high tech gadgets. Museum visitors were able to visit the Smart Park to discover native plant gardens, vertical rain and vegetable gardens as well as a 40-foot wind turbine. We may one day look back upon this exhibit and marvel at what was predicted and laugh at that which never materialized. It seems that every generation wants to take a stab at what the future may hold for us. The future is now in so many aspects of our lives that successful prediction seems harder than ever. Instead of predicting it, the generation of today may be satisfied just to live it.